When Sanjay Leela Bhansali made his version of Devdas, the much adapted (and abused) novella by Sarat Chandra Chattopadhyay, few doubted it was entirely the auteur’s view of the tragic hero. About 24 years before him, mainstream legend Prakash Mehra too had a take on Indian cinema’s most popular tragic hero in Muqaddar Ka Sikandar (1978). But the film was so radically mainstream that the complex was rendered almost unrecognisable. Of the many factors that differentiated it from the rest, dialogue writer Kader Khan was one. 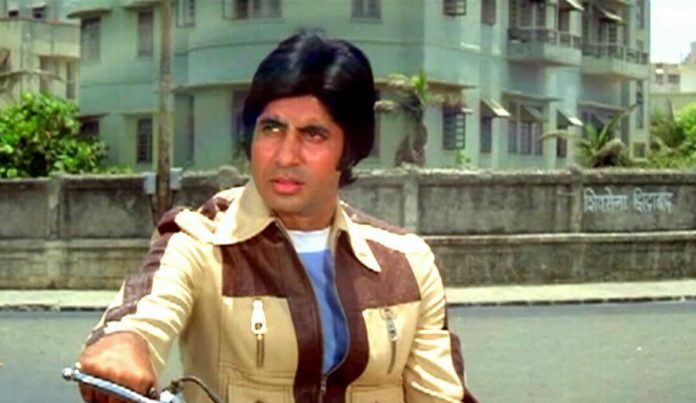 Khan elevated the film’s conventional screenplay with his punchlines and one-liners that are synonymous with superstar Amitabh Bachchan’s style till date. After a long and successful four-decade-long career as a writer and actor, Khan died in Canada last week. The ‘Devdas complex’—the trope of pining over an unattainable love—as many researchers call it today is one of Hindi cinema’s mainstays. In Muqaddar Ka Sikandar, Mehra used it to the hilt to create a larger-than-life sympathetic character, Sikandar (ironically named after the conqueror), and win over his massive audience. The result was a smash hit, one of the biggest successes of its decade. The film starts with an orphan child’s meeting with a wealthy man Ramnath (Shreeram Lagoo) and his daughter at the Shimla station. He is the kind of kid who mouths lines like, “Nahi sahib, main bheekh nahi lunga, mehnat karunga (I won’t accept alms, I’ll work)”. In a short sequence, the kid grows close to ‘memsaab’ Kaamna, in an echo of the childhood sweethearts arc of ‘Devdas’. Ramnath disapproves of this, and leaves for Bombay with his daughter. The kid follows them into the ‘city of dreams’, only to accidentally meet Fatima (Nirupa Roy) who adopts him when she hears him say lines like “Hum jaison ko apne paas rakhta kaun hai, sadak pe reh lete hain (Who gives a roof to people like us, we survive on the streets)”. She names him Sikandar. But this is Prakash Mehra’s world. So Sikandar is destined to be adopted by a woman who works in Ramnath’s house. In the quick sequence that follows, he is thrown out after being called a thief as he tries to leave his ‘memsaab’ a gift. Almost immediately, he also loses his newfound mother, plunging him into tragedy again. However, this time he meets a fakir at his mother’s funeral, who teaches him his biggest life lesson. Khan’s all-powerful populist philosophy served the film and its protagonist well. As Sikandar grows up to be a benevolent brother and businessman, he starts spouting one-liners in pure Hindustani (think “Nahi ise to main iske ghar jaake hi maarunga” in Bachchan’s baritone). But one thing doesn’t change. He’s still in love with his ‘memsaab’ Kaamna (Rakhee) who has no interest in him—this is one of the film’s major deviations from the Devdas narrative. However, other characters from Devdas do appear. Nautch girl Chandramukhi becomes Zohra Begum (Rekha) while Chunni Babu becomes Pyarelal Awara (Ram Sethi). Since this is a mainstream Mehra film, the cast has to be studded with stars. So the director casts Vinod Khanna as Vishal, Sikandar’s friend. The rest of it is about, well, the Devdas complex, with mainstream elements like a villain (Amjad Khan as Dilawar), action and a popular soundtrack. The Kalyanji-Anandji album, with lyrics by Anjaan and Mehra himself, retains its popularity even now with tracks like ‘Salaam-e-Ishq’, ‘O Saathi Re’ and the title song. 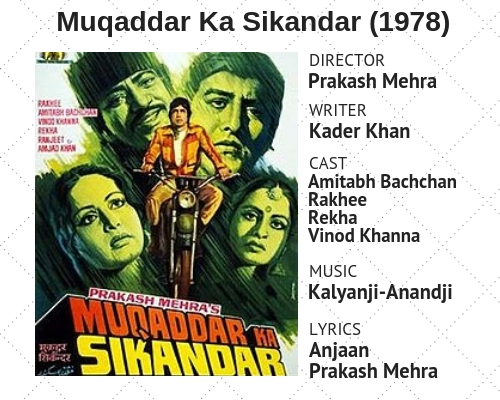 Kader Khan’s work in Muqaddar Ka Sikandar, conveying an array of characters through dialogue, is considered among his best ever in a film that was designed to be a crowd pleasing star-vehicle for Bachchan. And the star overpowered everyone and everything with his larger-than-life screen presence. As mainstream Hindi films have gained acceptance in the last two decades, their form has been understood and celebrated in all its kitschy glory. Mehra (and rival Manmohan Desai) are counted among those who helped create that genre. Unlike Bimal Roy before him, or Bhansali after him, he wasn’t interested in examining the psyche of his protagonist. His pursuit was to please his audience. In the endeavour, he was as successful as anyone else. As the end-credit tagline of Muqaddar Ka Sikandar reads, it’s ‘a film to remember’.